The village of Thiennes is about 8 kilometres east of Aire-sur-la-Lys, which is a town found on the N43 between Bethune and St. Omer. Leave Thiennes on the D122, heading east towards Haverskerque. Cross over the canal and continue towards Tannay, which is a hamlet on this road. 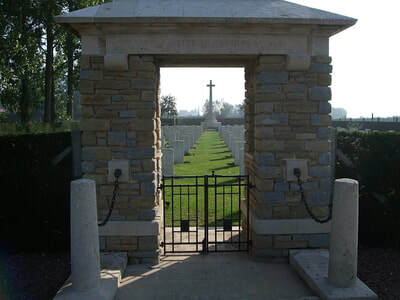 The Cemetery can be found on the right hand side of this road and access to the Cemetery is gained by passing along a 300 metre track in front of a farm house. 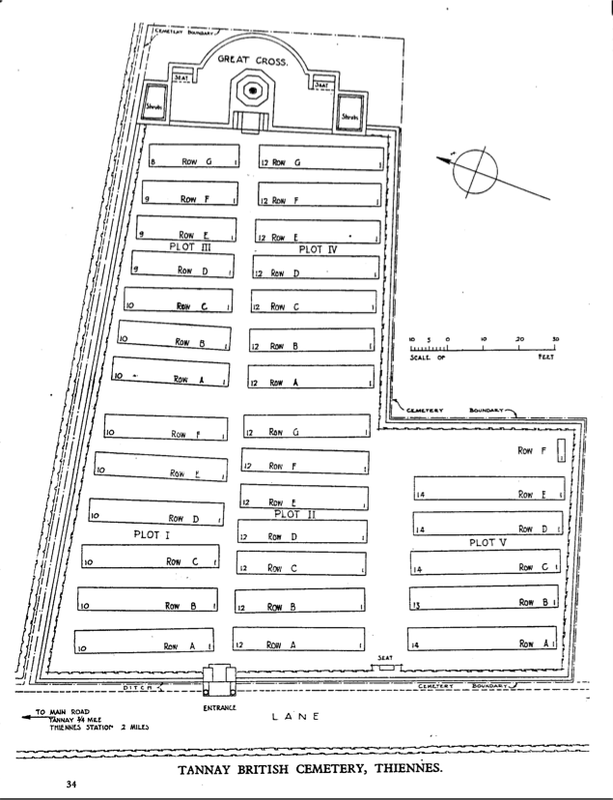 The Cemetery is on the left immediately after the farm. 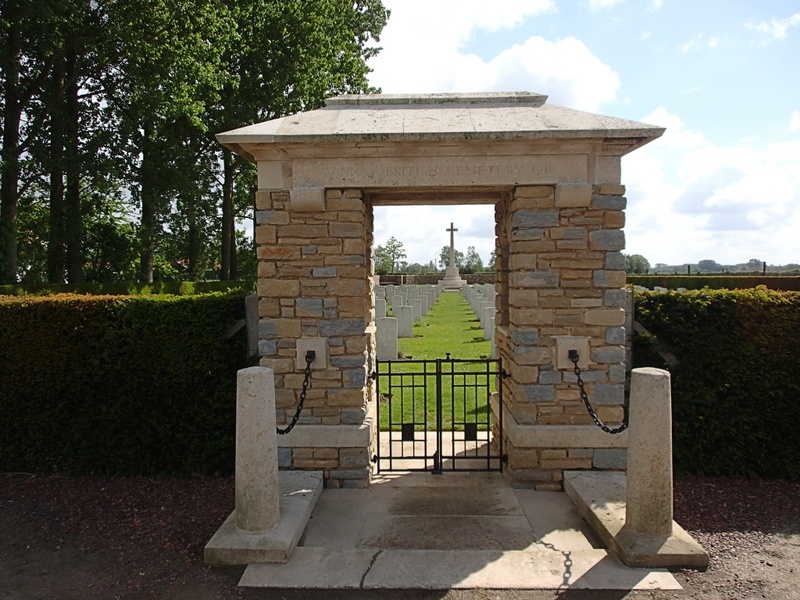 It was not until the German offensive of April 1918, by which Merville was overwhelmed and the German line brought past it along the Lys nearly as far as St. Venant, that Thiennes became a place of British burials. 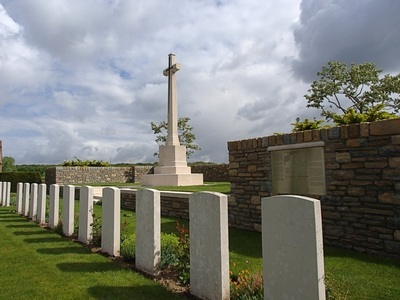 On the 10th of that month the first death occurred in the 13th Field Ambulance (belonging to the 5th Division) during its service at Tannay, and thenceforward until the first week in August 5th Division units carried out almost all the burials in Tannay British Cemetery. Row D of Plot II contains only men of the 1st East Surreys who died in May; Rows D and E of Plot IV only men of the 2nd K.O.S.B. 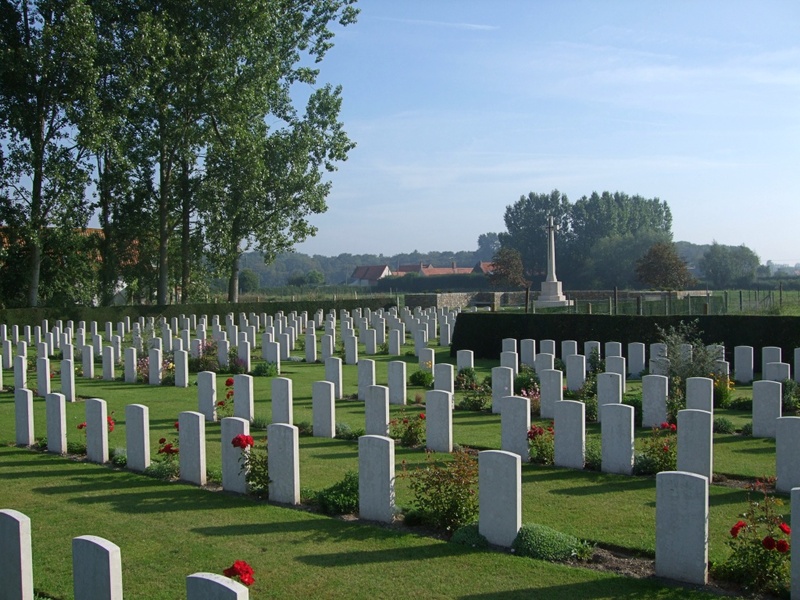 who died on the 28th (or in one case the 30th) June; and Row G of Plot IV only men of the 14th Royal Warwicks who died on the 8th July. In Rows C, D and E of Plot V the 61st (South Midland) Division made the majority of the graves, in the middle weeks of August. 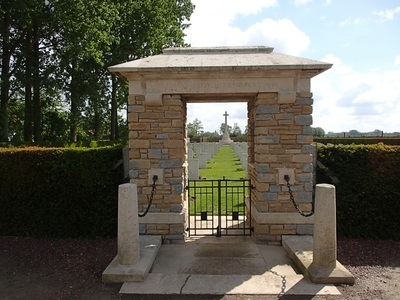 Thiennes saw fierce fighting once again in 1940 when it was at the southern end of the area occupied by the British Expeditionary Force during the withdrawal to Dunkirk. 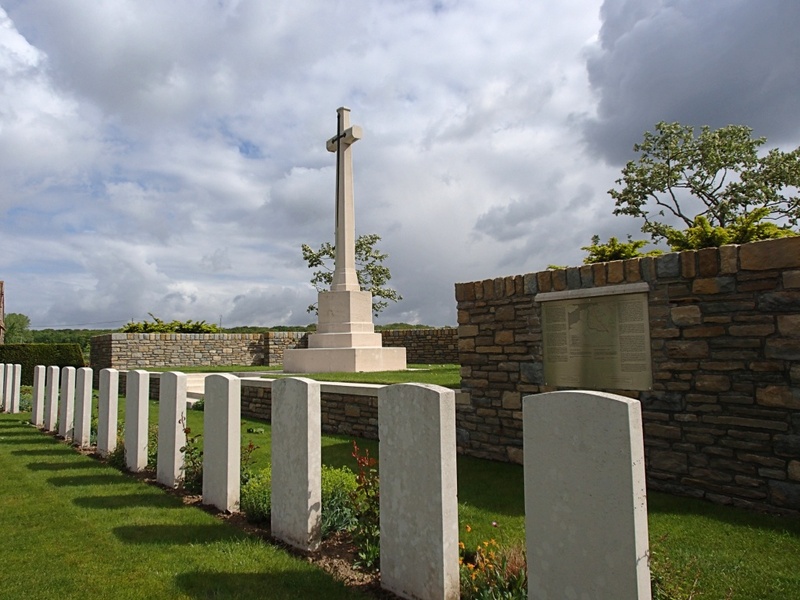 The cemetery now contains 363 First World War burials and 18 from the Second World War. 30th June 1918, aged 24. “4th July. Dear Mrs. Johnstone,--I am chaplain to the 2nd KOSB, and it is in deep regret I write to inform you of the death of your son, 23286, Pte. G. Johnstone, which took place on the 30th June. 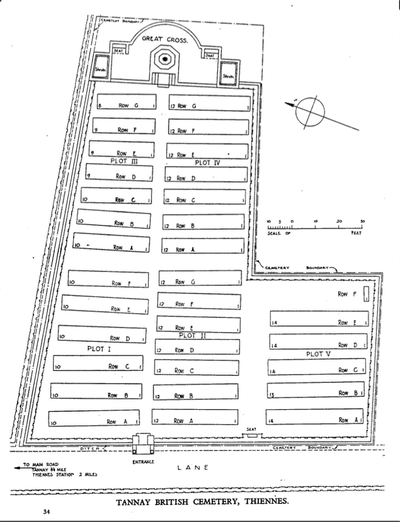 The battalion had made an advance, and for a few days after the enemy shelled our new positions rather heavily. Your son was in a trench beside Battalion Headquarters. The enemy started shelling this trench, and your son was one of the first to be hit. He was killed instantaneously. I was along in the trench a short time afterwards, and saw his body. He had a most peaceful expression on his face, and looked as if he were sleeping. 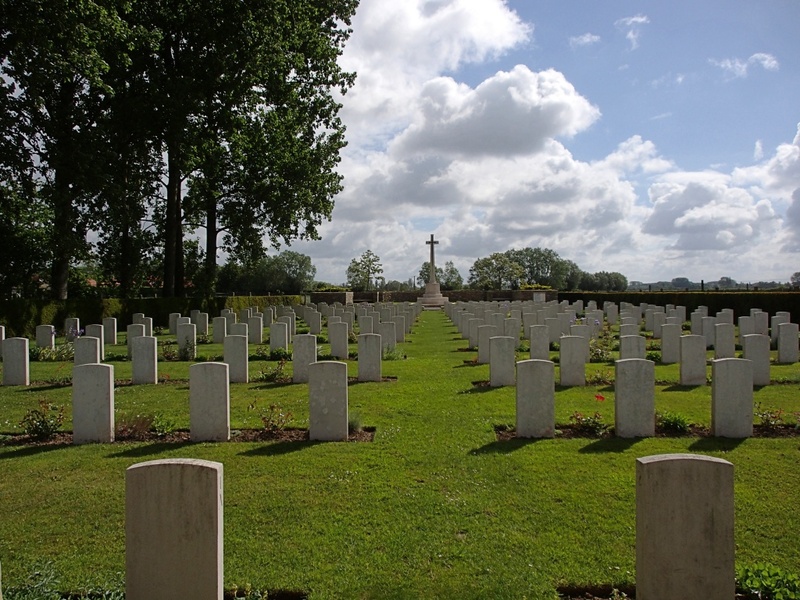 We brought his body back that night to one of our British military cemeteries five miles behind our lines, and buried him there with the usual Christian rites and military honours in presence of practically the whole battalion. He lies alongside others of his comrades of the battalion. We are erecting a cross over his grave on which full particulars will be printed. I can’t tell you how sorry I am over your son’s loss or how much I sympathise with you. I knew your boy very intimately, and had the greatest respect and admiration for him, as we all had from the commanding officer downwards. He was one of the best and smartest soldiers in the battalion, and always did his duty most cheerfully and most satisfactorily. He and I often had a chat together, and he often spoke to me of his home and people. The commanding officer and I were talking of him the other day, and he spoke in the very highest terms of him. I am sorry I cannot yet tell you where he was killed and where buried. May the Father of love be your comfort and stay in your bereavement, and at last bring you to your dear boy from whom you are separated only for a season. In Memoriam. 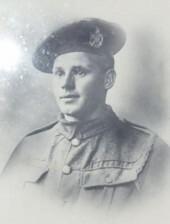 JOHNSTONE—In loving memory of my dear son and brother, Pte. G. Johnstone, 2nd KOSB, who was killed in action in France, 30th June, 1918, aged 24 years. We thought little when he left home that he would ne’er return, and now he lies in a soldier’s grave, and we are left to mourn. He sleeps in a grave in that far-off land, that comrades kindly made him; may he rest in peace in his narrow bed where friendly hands have laid him. For faith, for liberty, for truth, he offered up his stalwart youth; he died as ‘twere not death to give his life that all he loved might live.